Click to view the group’s Healthy Soils recommendations. 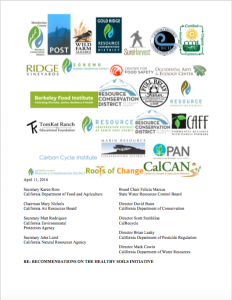 This week, nearly thirty agriculture and conservation organizations delivered a set of recommendations on Governor Brown’s Healthy Soils Initiative. California is proposing the first program of its kind in the country – a soils initiative aimed reducing greenhouse gas emissions and storing more carbon in our agricultural lands. How best to do this? The group grappled with this question by reviewing past and present agricultural conservation programs to see what works best and how these programs may inform the soils program. Support farm and ranch management practices that can increase on-farm carbon sequestration and reduce GHG emissions through a combination of practices, taking a whole farm systems approach aimed at optimizing the full range of climate change solutions of the farm or ranch. Ensure that a range of operation sizes and types (annual and perennial crops, pastures and rangeland) are able to access the program, reflecting California agriculture’s great diversity. Optimize climate benefits while supporting the economic viability of California agriculture. Prioritize strategies with environmental, health and resilience co-benefits. Build upon existing capacity within CDFA and through collaboration with existing outside entities, including leveraging existing conservation/sustainability programs from USDA Natural Resources Conservation Service (NRCS), Resource Conservation Districts (RCDs), and agricultural nonprofit organizations and trade groups to maximize the reach and impact of the Healthy Soils Initiative. When a competitive selection process is used, ensure that it is not onerous and does not put undue burden on producers. Integrate input from local growers to inform implementation of the statewide program. Include performance outcome and evaluation mechanisms. Provide resources for technical service providers, nonprofits, agricultural trade groups and others to support growers with application assistance, project planning, designing, implementing, and monitoring. This type of technical assistance and outreach will be critical to reach small and mid-scale producers and beginning farmers with limited resources. The letter also includes recommendations on how to support on-farm demonstration projects that bring together producers, researchers and technical experts, as well as implementation of grower incentives to increase carbon sequestration and reduced GHG emissions. What’s next? In May, the legislature will take up the Governor’s budget proposal for the Healthy Soils Initiative. We’ll report back on the budget process and how you can make your voice heard for sustainable agricultural solutions to climate change!